I love the colors of the quilt you posted! It looks so beautiful and cozy! Thank you! You should definitely get that machine out of the box and dive in! The scariest part is starting. 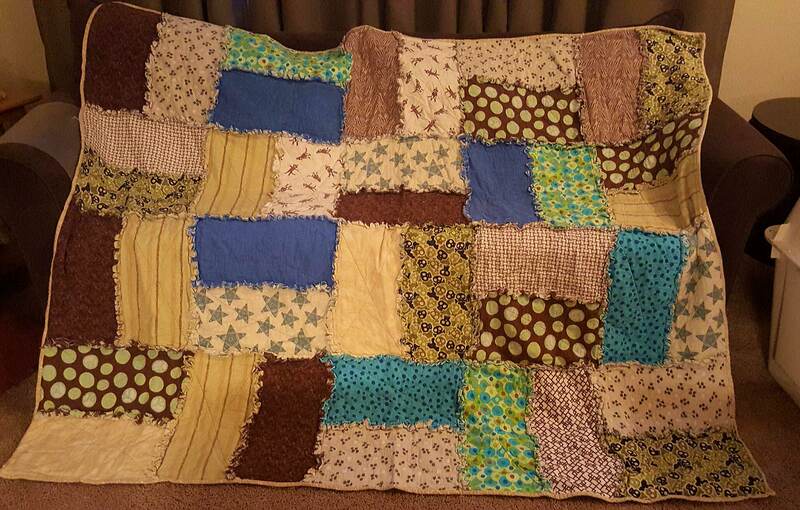 The rag quilts are a great quilt to start with. You “quilt” as you go so you don’t have to stress about the final quilting and they can be scrappy and who doesn’t love a cuddly flannel quilt! They are very forgiving with seams and lines. I am planning on getting this blog going better this year. It is a recent new attempt 🙂 I hope when you seen some of the other things I was able to make as a new quilter you will be inspired! I’m opening the box today, I’ve been waiting for my daughter to go down for her nap and she just fell asleep, so here I go!!! I’ve been blogging for many years, across all the major platforms. You chose the best one. 😉 If you have questions about anything, quilting or blogging, don’t hesitate to write me. I’m happy to help if I can. Your blog has a nice clean look to it, very appealing. Thanks for following one of my blogs!